Tags: dining table, grey, hardwood, stainless steel, table, trestle base, veneer, x base. The weathered oak finish on this rectangular veneered table compliments the beautiful stainless steel trim and trestle X base. Tags: Chair, dining chair, dining set, dining table, grey, nail head, oak, stainless steel, table, trestle base, veneer, x base. 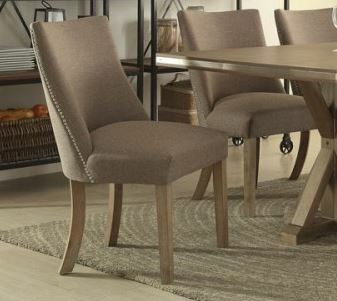 Tags: Chair, dining chair, grey, oak wood, sling back, wood legs.